Film Intuition: Review Database: TV on DVD Review: Family Guy -- "Partial Terms of Endearment"
TV on DVD Review: Family Guy -- "Partial Terms of Endearment"
As parents can attest, whenever we're told not to do something with little explanation, inevitably we become incredibly fascinated by that which has been forbidden. And even though we outgrow a lot of our childish impulses and behavior with age, human beings and particularly those who reside in this land of both the free and freedom of speech, don't often take too kindly to having others decide what is suitable for us especially when no laws have been broken. Thankfully we've come a long way in opening ourselves up to diverse points of view when you consider the sheer number of TV networks, motion pictures and forms of entertainment launched to win our viewership day and night. 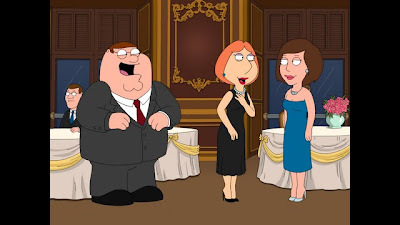 But upon discovering that Fox had banned a fully completed episode of Family Guy from the airwaves, interest was piqued, ink was spilled and ticket holders lined up to watch the show being read live by the cast in Hollywood. 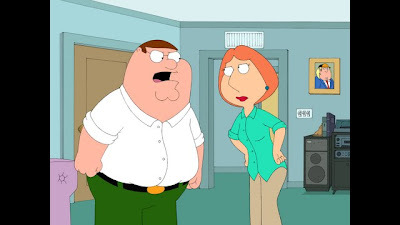 Yet audience members haven't exactly tuned into Family Guy for political correctness and although Fox felt that it was “too contentious” for broadcast, you just knew that their morals wouldn't get the better of their desire for dollar signs. 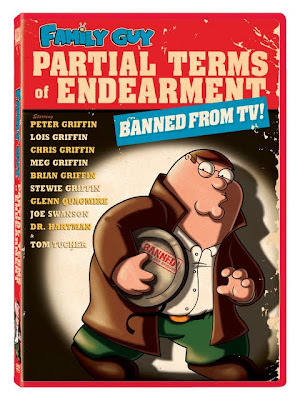 And fittingly since Seth MacFarlane's wickedly clever series is the “top selling seasonal TV franchise ever,” the episode in question “Partial Terms of Endearment,” has now seen the light of day alongside other uncensored Family Guy volumes and the Star Wars inspired popular feature length spoofs. Loading the succinct twenty-three minute main attraction with fan-friendly bonus features including nine original song downloads, full footage of the live table reading performance, commentary as well as a terrific mini-variety show special hosted by MacFarlane and his TV wife Alex Borstein, the disc will not disappoint die hard enthusiasts. Admittedly, as both an avid devotee and critic of the series (on disc rather than on air) and a politically minded viewer whose own beliefs and opinions strongly coincide with MacFarlane and company, watching this particular DVD was like preaching to the choir when it came to evaluating the material itself. 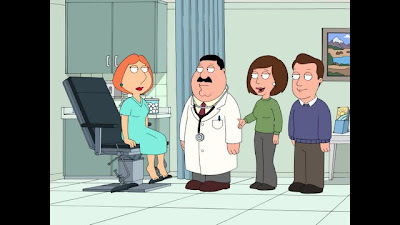 Yet it's easy to see why the network blushed even greater than a man when you tell him it's your time of the month, given the risky subject matter as Lois faces the entire maternal spectrum of fertility, surrogate pregnancy, abortion, adoption, pro-lifers, pro-choicers and the medical community upon reuniting with an old college friend. 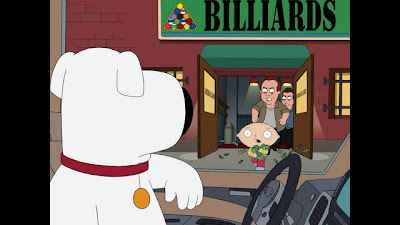 Going for the jugular, while Family Guy is even more outrageous as usual, ultimately it's not quite as horrific as the controversy would lead you to believe since more often than not, MacFarlane's crew manages to simultaneously stimulate both thought and laughter. Further managing to attract and repel us throughout, “Partial” is dynamite proof of what's now become their modus operandi. Daring to take every joke to its breaking point of taste vs. content, despite a few instances when the dialogue only operates on the level of vulgarity rather than victorious, it's a brilliantly provocative satire of the double standards and issues facing women and their loved ones from conception onward. Far more successful for the way it pokes fun of both sides of the abortion debate a la Alexander Payne's Citizen Ruth , “Partial” even bests Payne by bringing a whole new argument to the table when the Griffin family addresses the way that men “abort” on a routine basis. All in all, it's quick-witted and fast-paced. 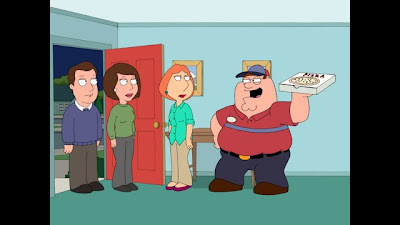 And even if you disagree with the politics of the show and prefer to watch it for crass laughs rather than sophisticated subtext, it's another reminder of just how criminally underrated both MacFarlane's series as well as its audience are by those who'd rather feed us reality TV than TV that deals with reality in a fresh way.